In the days when Britannia ruled some 25% of the world’s land, it did so because it also ruled the oceans. Both in military and commercial respects, Britain’s sea power was unmatched for over one hundred years. But the long reach of maritime power involved extremely long voyages, with the threat of mutiny always percolating beneath the surface, and was a constant threat to the discipline needed to bring ships safely back to port. The most infamous mutiny occurred on the HMS Bounty in the south Pacific in 1789. Disaffected crewmen, led by Lieutenant Fletcher Christian, seized control of the ship from their captain William Bligh and set him and 18 loyalists adrift in the ship’s open launch. The mutineers variously settled on Tahiti or on Pitcairn Island. The term mutiny is commonly used for a rebellion of sailors against their superior officers, but can also refer to any type of rebellion against authority. We don’t have to look far to see modern day mutinies occurring everywhere, whether in the social sphere or the world of money. The clearest example of the 21st century’s growing buccaneerism is Donald Trump, who triumphed as the Republican presidential nominee. Against all odds, he has assembled a crew of disaffected voters who put Trump in charge of a successful takeover of the GOP. Much like the captains getting set adrift by the mutineers on the high seas, traditional GOP candidates were mocked by Trump and jettisoned to an uncertain fate by an angry right-wing electorate. Hillary Clinton faced her own mutiny, and only won the Democratic nomination by having to fight off the rebels of the Bernie Sanders campaign. Early gentility between these two camps gave way to bare-knuckle campaigning as Sanders’ campaign grew in popularity and momentum. Unable to clinch the nomination, the Bernie-ites were nevertheless able to nudge the Democratic platform a few feet to the left, and live to fight another day. But the most profound modern mutiny is Brexit. On June 23rd, Britain voted to leave the European Union (EU), a common market relationship with roots stretching back to the 1950s. Dissatisfied with a lack of growth and jobs, suspicious of free immigrant movement across borders, and tired of subservience to the EU bureaucracy, the “have nots” of the UK voted to go it alone. In truth, Europe stands to lose as much as Britain in the fallout from Brexit, so cooperation will probably prevail simply to keep badly needed trade moving. But the vote underscores that the deep distrust of the EU has moved from loud complaining to the point of action. The fault lines leading to the Brexit earthquake are clear, as Greece continues in a depression, Spain’s unemployment continues to hover around 20%, and some of Italy’s banks are quietly teetering on the brink of insolvency. The problems that have plagued Europe since the credit bubble collapse are nowhere near being solved. Britons have watched as these countries have been bailed out, and they and other northern European EU members are feeling betrayed by the flagrant disregard for the fiscal discipline that was supposed to govern the use of the common currency, the euro (€). The lack of a unified fiscal policy, but unified monetary policy via the European Central Bank (ECB), means that monetary policy will be driven by the needs of the lowest common denominator (e.g. Greece). In practical fact this has meant that bailouts, past and future, are shared among members and the UK felt, perhaps presciently, that they wanted no part of that obligation. We think eventually there is a good chance other, wealthier EU members will leave the club for that very reason. Banks are also beginning to mutiny against their central bank overlords. The extreme policies that characterize central banking today have resulted in some $12 trillion (not a typo) of government debt trading at negative interest rates. Eight years of “quantitative easing” (QE) and zero to now sub-zero yields have many banks questioning whether they can maintain their business models. One of the largest banks in Europe, Germany’s Commerzbank, is reportedly considering hoarding billions of euros in cash in physical vaults, rather than depositing it at negative rates with the ECB. This would be seen as a huge protest against the ECB’s negative interest rate policy (NIRP), but implementing it may be problematic: €1 billion in €200 notes would weigh more than five tons. In Japan, Bank of Tokyo Mitsubishi is considering quitting as one of the 22 primary government bond dealers in a sign of stress in a debt market struggling to cope with the Bank of Japan’s (BOJ) unprecedented stimulus. Because yields in Japan are negative, a bank holding government bonds must essentially pay to hold the bonds, guaranteeing a loss. Bank of Tokyo is simply the latest to realize that central bank policies are making banking an increasingly difficult business. Without the ability to earn a positive interest rate, the incentive to participate in the auctions for new (negative-yielding) bonds dwindles. Unfortunately, the Japanese treasury is issuing bonds at a breathtaking rate, and the BOJ is set to buy $1.1 trillion worth, or more than 90 percent of securities issued in the market this year. Have investors thrown all caution to the wind, in a sort of mutiny against the financial orthodoxy of the post-WW II period? Buyers of negative-yielding bonds would seem to be doing just that. At least yields in the US are positive, providing a pittance of income on domestic bonds. Buyers of negative-yield bonds can only hope that yields fall even further into negative territory, and that they can sell their holdings to a greater fool who thinks extreme monetary stimulus can continue forever. Markets are in the seductive throes of TINA FOMO. TINA means There Is No Alternative to owning stocks or other risky assets. Yields on risk free assets (i.e. 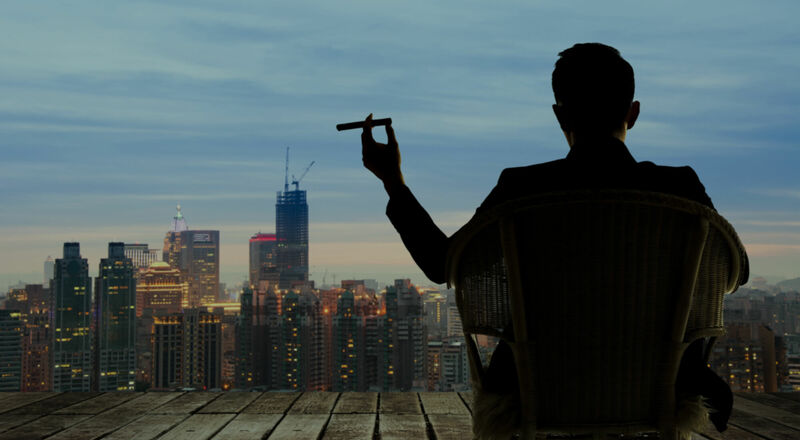 money market funds) have been suppressed into insignificance, making it easy to justify moving to stocks, bonds of all qualities, and other species of income-producing security. Managers charged with earning a return on client monies feel they have no choice but to play the only game in town, the stock market. But just because the “social proof” of other investors’ behavior is reinforcing the TINA mindset, doesn’t mean that risks have disappeared. FOMO stands for Fear Of Missing Out. Money managers have become accustomed to the performance enhancing drug of QE to power stocks higher. Once QE stopped in late 2014, stocks spent over a year in a slightly descending trading range before making new highs this month. Unable to earn much yield in traditional safe havens, investors have been quick to chase emerging trends, and equally quick to abandon them, creating a high degree of volatility in the markets. Moreover, the logical connection between stock and bond behavior has been broken, at least for the time being. After coping with the shock of the Brexit vote, for example, investors were further shocked to see stocks move to new highs, while government bond yields plumbed all-time lows. Stocks are sending a message of growth, while bonds are sending a diametrically opposite message of weakness and deflation. But the fear of missing out has institutions rapidly exploiting trends, regardless of any economic logic to the contrary. This cognitive dissonance is underscored in the relationship between stock prices and earnings growth. Classic investment theory assumes that earnings are the primary driver of stock prices. Corporations have taken advantage of years of low rates to issue debt to buy back their own shares, rather than invest in capital expansion. While this has flattered earnings per share by spreading the same earnings over fewer shares, it now appears that the earnings manipulation merry-go-round is coming to a halt. Aggregate earnings growth has been falling, and is now negative year-over-year. 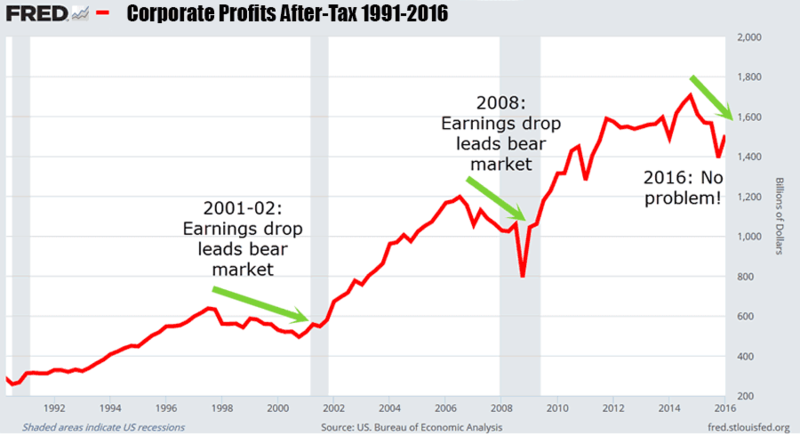 But major US stock averages have rallied 20% in a five-quarter earnings recession that saw corporate profits decline 20%. The economy has grown at only a 1% rate over the past three quarters. In any previous bull market this would have had investors selling as their expectations (and valuation models) were disappointed quarter after quarter. But in the Alice in Wonderland world of TINA FOMO, investors have barely batted an eye. For the only thing that seems to matter today is being invested, regardless of the risks involved. Where does that leave the long-term investors today? Should they join the mutiny against traditional valuation yardsticks and throw caution to the wind? Should they join the maddening crowd that is convinced we have entered a new paradigm for securities analysis? We believe investors must stick to their standards, and, importantly, not abandon common sense. In the classic tome A History of Interest Rates, a 4000-year survey of rates found not a single instance of negative interest rates. Is it plausible to believe that central banks can bend markets to their will and force investors to accept zero or negative interest rates for the foreseeable future? We don’t believe so, and can already see common sense pushing back against the central banks. Thus, it seems probable that rates must revert to some normalized positive level, once overt repression by central banks ends, or a “mutiny” among yield-starved buyers pushes yields up. This is a key factor that investors must be vigilant about, and one that will have profound effects across all financial markets. The mutineers of the Bounty didn’t escape the universal standard of British justice. Once news of their nefarious deed reached England, they were hunted over thousands of miles of ocean and, in 1792, fourteen were captured in Tahiti. In a financial world rife with contradictory indications and illogical behaviors, we don’t think investors will be able to escape the universal standards governing financial asset prices. Valuations still matter, and they remain high. But price trends are bullish, and so calls to abandon investment principles are all the more seductive. The twin peaks of 2000 and 2008 offer a valuable lesson to investors today, as each time a “new era” was invoked for ditching the standards that had governed investing for 60 years. In the end, common sense standards mattered. Today is no different, as TINA is used to justify any purchase. Trusting to commons sense standards will allow investors to successfully weather the mutinous environment we have today.